This is a replica of a reading candle holder. It sits by the chair and you can adjust the height to the best height for reading a book. Well there you go! Just like a Project I had on here and don’t even know if it’s still there. 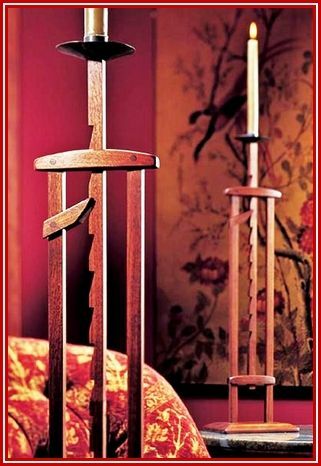 Their called “Ratcheting Candle Stands” from the early 1900’s. Yes they can be used for Reading and also a multitude of other Purposes as they were pretty well the only source of Light they had in those days. Thanks for showing me your picture. That is the only other one I have seen a picture of that someone had built. My daughter stole mine. This is a nice reproduction and will make a great conversation piece. You’re certainly Welcome. Download this one and DON’T tell your Daughter you have it! ....LOL..